You’re gonna love this one. I’m going to be at Annie’s Book Stop in Worcester, MA at 7pm, with a whole bunch of other folks from some fantastic anthologies. And if you feel like helping out an independent bookseller (which you should!) Annie’s Book Stop’s owner has an IndieGoGo campaign happening: Check that out! It’s been a lousy few days. I’ve been sick–again! And it’s stomach trouble, again! As I groggily make my way through another sick day, though, I have some good news. 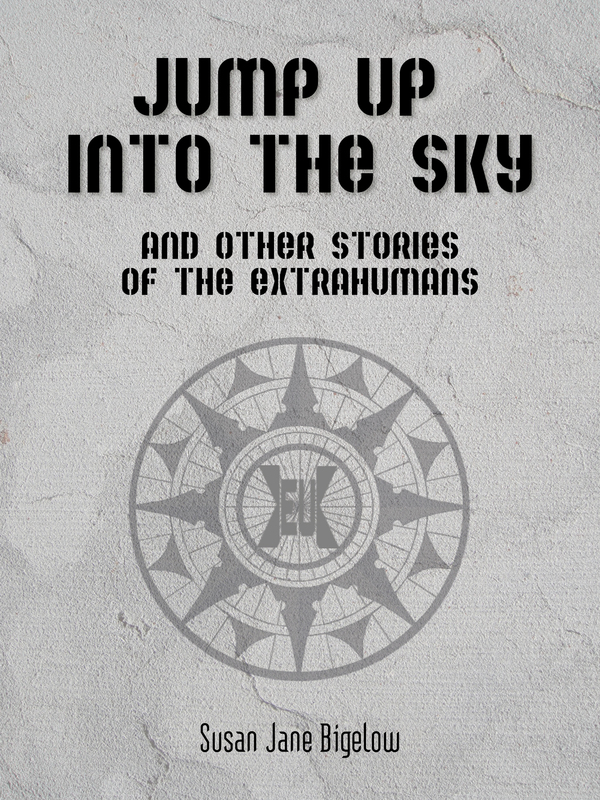 The three Extrahumans short stories I wrote that were previously only available to people who had pre-ordered one of the three print books are now collected into a single ebook on Amazon! When we did pre-orders for the print edition of Broken in November, 2011, my publisher suggested I write a short story as a reward, because we were doing them through Kickstarter. That made sense, so I wrote a story called “Jump Up Into the Sky,” which is about Sky Ranger crashing into an old woman’s garden. That story is supposed to serve as a bridge between Broken and Fly Into Fire, and it’ll make way more sense if you read Broken first. That worked well, so we did it again for the release of Fly Into Fire in January of 2012. This story is a prequel, set about fifteen years before Broken, and it features one of my favorite characters–Crimson Cadet! In this story the Law Enforcement Division, led by the Union’s new Sky Ranger, has to track down a girl who supposedly has extrahuman powers, and Crimson Cadet has to face up to all the things about extrahuman life that make him uncomfortable. In August, 2012, The Spark came out, and once again we decided to use a story as a Kickstarter reward. This time I chose a short I’d been thinking of turning into the beginning of the fourth Extrahumans novel. I decided not to do that, going in another direction to focus on Jill instead, but I liked this piece and what it said about Renna. It’s set nearly 20 years after Renna leaves home, sometime after the events of The Spark, and it’s about what happens when she goes home to be by her dying mother’s side. I hope you check these stories out! They’re cheap, only $0.99, and free if you’re an Amazon Prime subscriber. On Wednesday night I finally resolved the last comment, closed my eyes, and sent the manuscript for THE SEEKER STAR (Grayline Sisters #2) off to the publisher. I know, I know, this is a normal thing. But this didn’t feel like a normal kind of book. I’m gonna talk about my process and my own challenges in writing this book, so feel free to look away! I started writing this as a direct sequel to DAUGHTER STAR, and it was to have continued the adventures of Marta Grayline. But after a whole lot of false starts and about a year’s worth of agonizing, I realized that I’d already told the Marta story that I wanted to tell. I then thought about her sister Violet, and came up with a scenario in which her marriage falls apart and she goes off in search of her missing sisters. I probably wrote 20,000 words in a week, and once I surfaced I knew I had something. That’s when the plan to have three books, one about each Grayline sister, formed. But this book turned out to be anything but easy. Violet’s story was damn hard to write, and life kept getting in the way. I was on track to finish the rough draft in the summer of 2012, but surgery and recovery got in the way. Then I was contacted to write my piece for QUEERS DIG TIME LORDS, the edits for DAUGHTER STAR, which were among the toughest I’d ever been given by an editor, came back, and THE COLLECTION from Topside Press released. I didn’t finish the rough draft until October, and then put it aside, exhausted. The editing and revising passes were a huge challenge. The story felt like it needed so much more fleshing out, and the story problems were so major that I felt I might never actually resolve them. A lot of people cut tons of material when they revise, but I don’t. My rough drafts are like sketches, and I fill in the details when I revise. To give you and idea of what I mean, the rough draft had about 65,000 words; the final manuscript has over 96,000. Not that I didn’t cut things, I absolutely cut a lot, but I added a lot of story, background and character development in as well. In short, this book felt like a fight. But I think what came out of that long, difficult process is pretty good, and I think people who liked THE SPARK and THE DAUGHTER STAR will like this one a lot. The Seeker Star: Done, turned into publisher. Whew. Bells of Valen: Extrahumans #4. I’m planning on getting to revisions for this book soon, promise. The first draft is written and is in a terrible state. Much fixing needed. Siphane and the Whale: Cranky robot girl teams up with introvert to save her friends. Working on revisions, this is probably next on my list to get done. The Falling Star: Grayline Sisters #3. Planning stages. I have bits and pieces written. Looking for a significantly different feel to this book than the previous two. Plus columns at CT News Junkie every week!